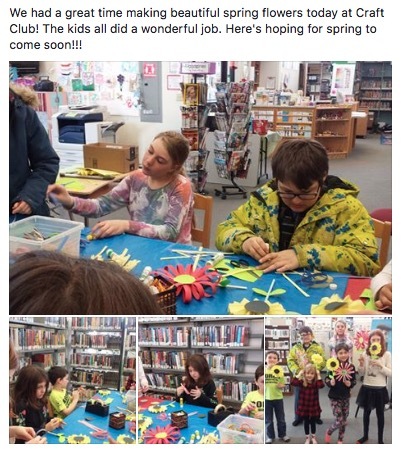 Craft Club – April 10, 2018. Our hours are now Monday-Friday (inclusive) 11:00a.m. – 7:00p.m., and Saturday 11:00a.m. – 4:00p.m. The library will be closed Sundays and all holidays. Come on down to the library! We look forward to seeing you! New books on the seven-day fiction shelf this week: “The Woman Left Behind” by Linda Howard, “The Bishop’s Pawn” by Steve Berry, and “An American Marriage” by Tayari Jones. New on the seven-day non-fiction shelf: “Happiness is a Choice You Make” by John Leland. On Tuesday, we have Craft Club, Wednesday is Clay Club, Thursday is Drawing/Beading Club, and Friday is Game Day. All clubs are 3:30-4:30 for ages 4-12 and anyone under the age of 6 must be accompanied by an adult. Come on down to the Wawa Public Library and participate in our after-school programs. Our drop box is in place for your convenience. You may deposit your returns only in the drop box when the library is closed. “Shadow Play” by Iris Johansen, “The Liar” by Nora Roberts, “The Secret Life of CeeCee Wilkes” by Diane Chamberlain, and “Random Passage” by Bernice Morgan. “Random Passage” – The chill Atlantic lies between Lavinia Andrews and the England she loves after a shattering incident topples her family’s fortunes. Shocked, she can barely comprehend that the Andrews family will call Random Passage home from now on – this tiny settlement perched on rock between dense forest and the inhospitable ocean. Wresting their survival from the sparse soil and the capricious ocean, Lavinia, her sisters and brothers, their families, and their mother work side by side with the capable Vincent family, the determined and mysterious Mary Bundle, and the enigmatic storekeeper Thomas Hutchings, who might have been a priest or a murderer. Come on in and check out our great selection of books, magazines, DVD’s, Blu-rays, Audiobooks, French books, and more. And don’t forget our awesome Children’s collection! The Wawa Public Library also has many other services available such as photocopying, faxing, laminating, printing, and conversion of VHS to DVD. Free WiFi is available at the library. We have 4 public computers as well as 3 I-pads available for public use. Please inquire at the circulation desk. The Wawa Public Library Board meetings are held the third Monday of each month at 6:30 p.m. at the Municipal Council Chambers. The next meeting will be held on Monday, April 16, 2018 at 6:30p.m. in the Council Chambers of the Municipality. Everyone is welcome! Remember – library membership is FREE to residents of the Municipality of Wawa and contracting communities.